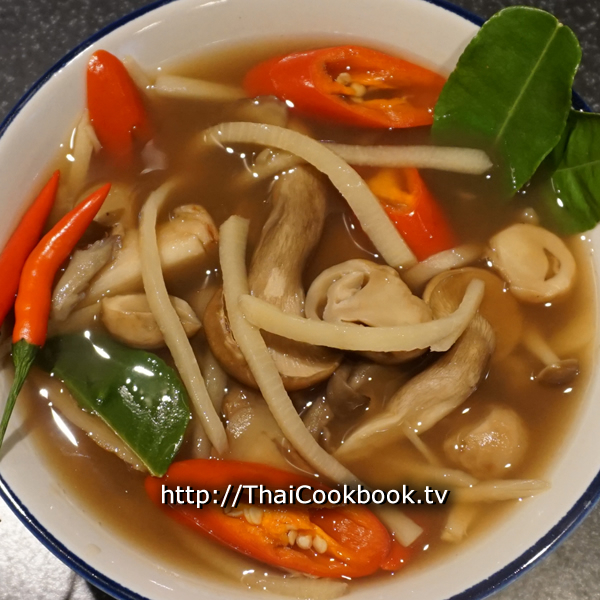 If you enjoy mushrooms, then you'll love this delicious Thai soup with a rich and earthy broth flavored with lemongrass, galangal, kaffir lime, and tamarind. We like it spicy, so we add a few of our very hot Thai chilies, but they can be left out and the soup still tastes great. Known as Kaeng Hed, this vegetarian recipe will be especially satisfying to our friends that don't eat meat. What's in our Spicy Vegetarian Mushroom Soup. How we make our Spicy Vegetarian Mushroom Soup. 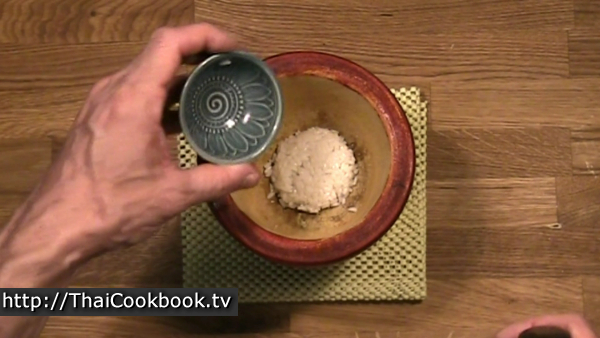 1) Grind the glutinous rice into a fine mush. 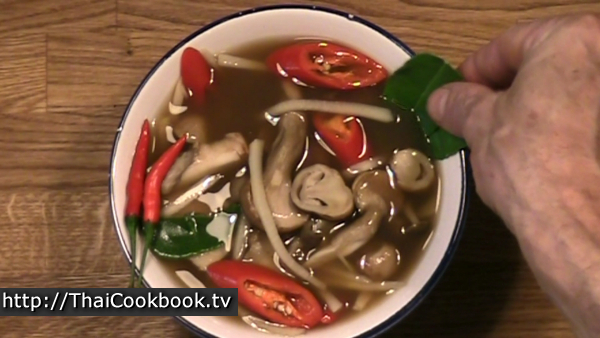 2) Clean cut and prepare the mushrooms, lemongrass, galangal, kaffir lime leaves, and red chili. 3) Boil the galangal and lemongrass in 2 cups of water for 5 minutes, then season with ground rice, soy sauce, tamarind paste, and hot chili. Boil for one more minute. 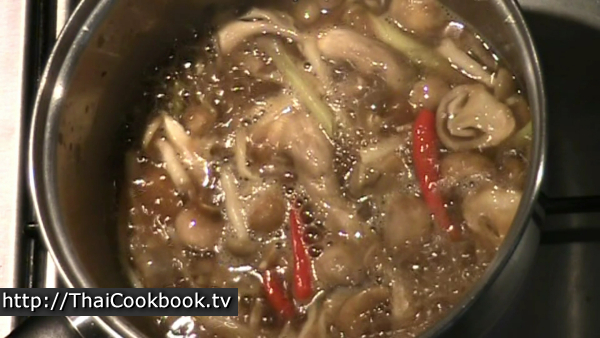 4) Add the mushrooms and bamboo shoots and boil them for 5 minutes, or until softened. 5) Add additional tamarind, soy sauce, or salt as need to balance the flavor, then add the mild red chili and kaffir lime leaves. Boil for one minute more, then serve. To make this delicious vegetarian soup I'm using a variety of fresh mushrooms, and cooking them in a rich herbal broth made with lemongrass, galangal, and kaffir lime leaf. You can balance the flavors of spicy, sour, and salty to your particular tastes by using more or less hot chili, soy sauce, and tamarind paste. Before you start, soak about 2 Tablespoons of glutinous rice in water for about an hour. The rice will be used to thicken the soup, and it also adds texture and nutty flavor. Drain the water from the rice and let it drip dry through a strainer. Now grind the rice with a mortar and pestle. When it's done, you'll have a wet and chunky paste. Be sure that you keep working on it until most of the rice kernels are cracked. 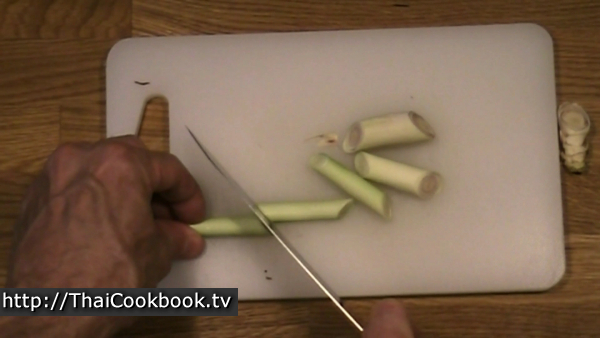 Slice two or three 1/4 inch pieces of galangal, and cut one lemongrass stack into pieces. Hit the lemongrass with a knife handle to crack them open just a little. This will release more flavor. Also hit and slightly bruise the hot chilies to release the spicy juices, but keep the chili intact. If you want your soup to be very spicy, then chop the chilies. The chilies are optional, so you could leave them out. Slice the large mild red chili on a diagonal, and peel the center stem out of 2 kaffir lime leaves and break the leaf halves into a couple of pieces. Rinse and drain the prepared bamboo shoots. 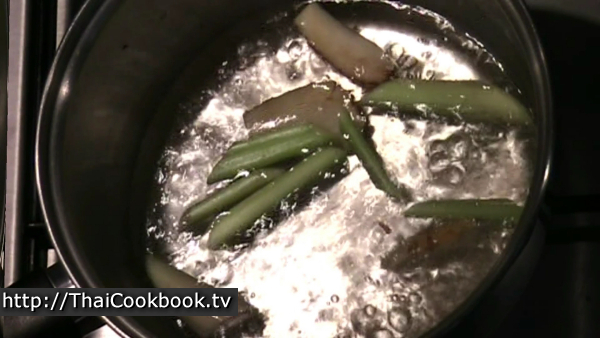 Boil 2 cups of water, and add the lemongrass and galangal. Boil for about 5 minutes. Then add the ground rice mush and let it begin to dissolve. Next add the soy sauce and tamarind paste and stir it in well. Also add the hot chilies, then bring the soup to a hard boil for about a minute. 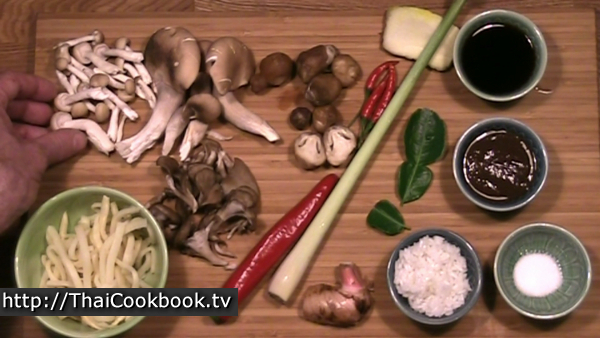 Add the bamboo shoots and mushrooms. Boil the soup now for about 5 minutes, or until the mushrooms are soft yet still firm. 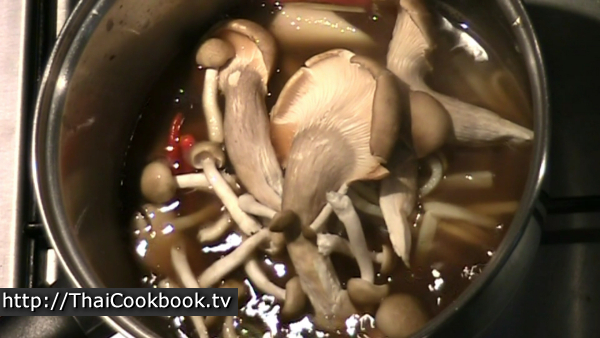 You can add a little water as needed to keep the broth covering the mushrooms. 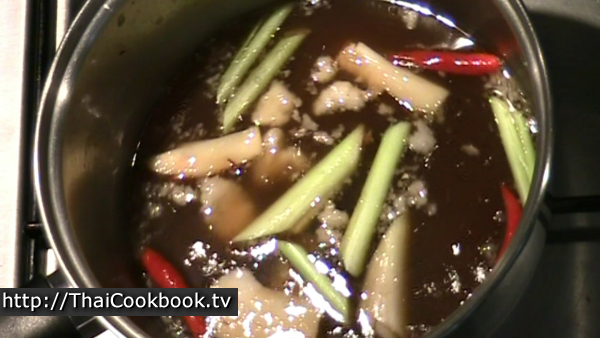 Taste the soup, and add more soy sauce, tamarind paste, or a little salt if you think it needs it. 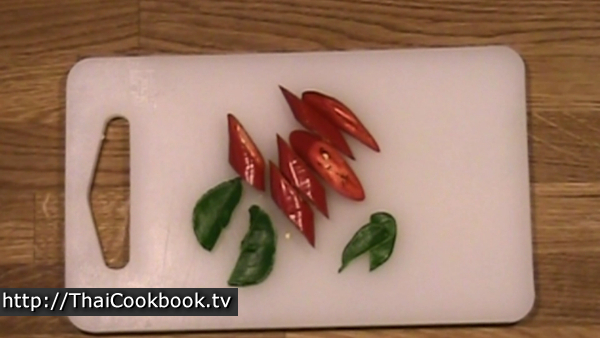 When it tastes right, add the mild red chili and the kaffir lime leaf. Boil for one minute more. Remove form the heat. The red chili should still be a little crunchy, so don't overcook it. Garnish with some fresh hot chilies and a couple of kaffir lime leaves.